From time immemorial, different mushrooms such as shiitake, reishi and white mushrooms have been valued by humankind as a culinary wonder. The last decade has witnessed an accrued interest of westerners in mushrooms which has sparked more research into the wonderful world of mushrooms and pharmaceutical potential thereof. Thus far, scientific investigations on mushrooms have found them to be anti-oxidant, anti-tumor and anti-cancer. Alas, destiny caused me to discover chaga a few days ago while at one of my favourite restaurants. Chaga mushrooms have a rather peculiar and unusual look, especially as compared to soft mushrooms. They are hard, almost like wood and have traditionally been used as medicinal mushrooms as part of Oriental folk medicine. Be forewarned, you may be grossed out by their appearance if you Google them (let me guess, you’re googling them right now 😉 ). Not only are they good for preventing cancer thanks to the antioxidants and superoxide dismutase (components which also exhibit anti-cancer activity) they contain, they may mitigate the negative effects of chemotherapy. They also contain beta-glucans, which can modulate immune system response, and are thus not a shabby idea for our cold winter months. 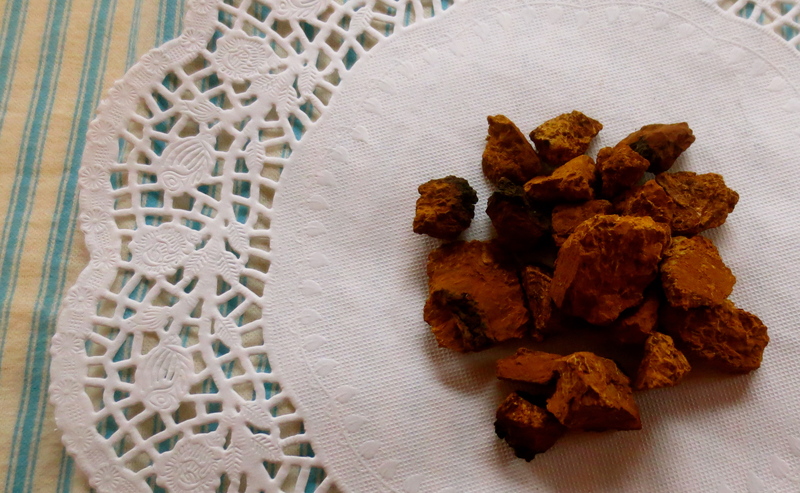 Chaga is also thought to be great for liver and kidney health. Wouldn’t you know it, these ‘shrooms happen to grow right here in our province and can be found in various health food stores across Quebec. These mushrooms are not easily assimilated by our body and aren’t edible (and I am skeptical of how much of a delicacy they would be if we were able to do so). The only way we can absorb the goodness they contain is to infuse the mushrooms in hot water, yielding a delicate-tasting tea. 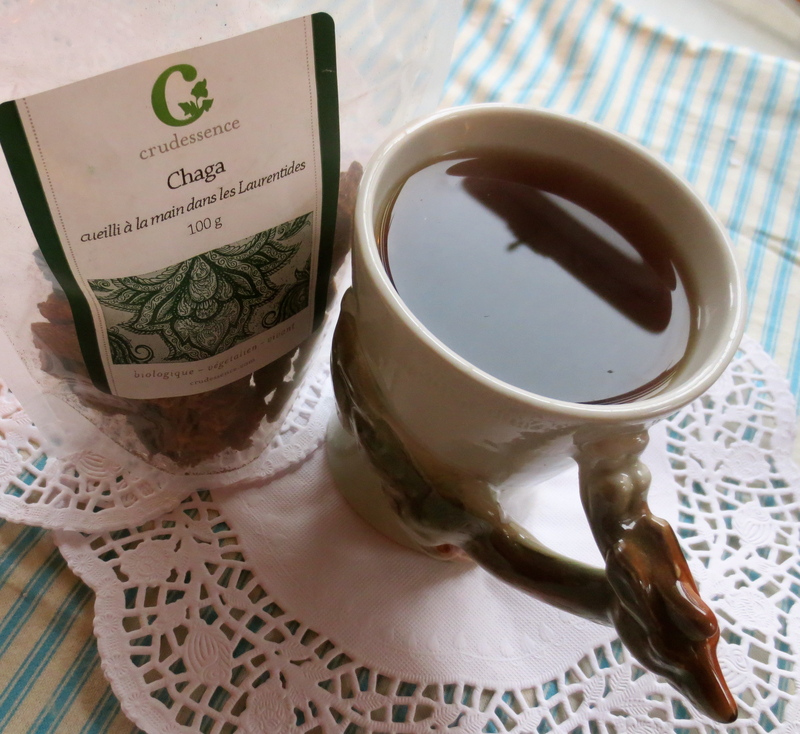 Personally, I love the mild taste of chaga tea on its own but if you find it too bland, you may want to throw in a bag of chai tea and a bit of non-dairy beverage to add a bit more flavour. Give chaga a chance 🙂 . wow, great idea! i’m definitely gonna give chaga a chance 😉 thanks!